The internet helps Mogo explain himself. Recently he told me that he’s in this painting of an incident in the 30 Years War. He’s the man on foot wearing the size XL cuirass in the lower left foreground. The next day Mogo fired the lackey for making gestures behind his back. 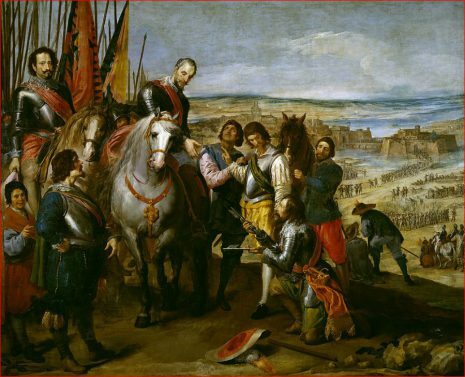 The horseback grandee on the right is Spinola accepting the Dutch surrender. Spinola was a widely-admired Genoese general fighting for the Spanish Empire who was known for his civilized and humane comportment. That was in short supply in those days, as you can see by the rough way the Spanish soldier behind the kneeling Dutch commander is indicating what the Dutchman should do. Mogo crossed paths with the Odyssey. As he told it to me, he was sleeping on the beach at Sheria with his theatrical troupe — they were on their way to the festival in Corinth — when Captain Odysseus’ ship crunched into the offshore rocks, all hands lost (again) except great-hearted you know who. Odysseus was emerging from the woods to seek help from Princess Nausicaa, who had come to the beach with her girls to do the palace laundry. and he stepped on Mogo’s face as he (Mogo) was sleeping under a myrtle bush. Even in those days it wasn’t often that a stark naked — that night Odysseus had survived his third or fourth shipwreck — middle-aged war veteran steps on your face while you’re sleeping on the beach. Cunning Odysseus, man of many strategems, shrugged and made several other Greek-type gestures indicating that he was without any particular strategem at the moment. Athena brought her box from the ship and it only took a minute to dye the Mastermind of War’s grizzled hair black, to give him a scrapedown with a real professional strigal, a Man-Tan treatment, and to change his olive oil. 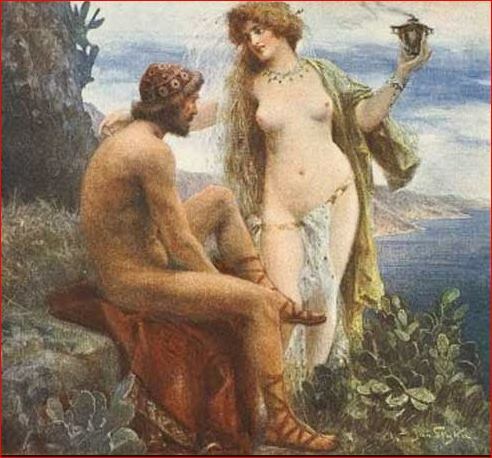 When Odysseus went out on the beach and gave his suave greetings to Nausicaa, he was a real knockout, really godlike, as she wrote in her diary that night. Well, here it is the 20s of July again, when, 101 years ago, the diplomatic hustle-bustle that led to World War I was going on. On the 23rd, the entire German foreign ministry and military ostentatiously ‘went on vacation’ to show the world that everything was okay and nothing was happening. Count von Mogo, an important official at the time, took off his heavy gold-braided and bemedaled uniform, combed his huge mustache, and really took off on vacation, under the impression that all the war talk and jitters were “Nur ein Wind von der Hüfte” as he put it. General mobilization caught Count von Mogo on the beach at Atlantic City. The Count was immortalized by a fast-thinking press photographer who clicked the famous shot of the count as he heard the news. Count von Mogo was wearing his favorite striped wool bathing suit and a straw skimmer; he was buying lunch for a young lady at a hot dog cart; his monocle is seen falling into the mustard. It was summer 1914.